Our team took a deep dive into the redesign of BrightWater Bay’s new website! Their old site had a lot of great information, but it wasn’t presented intuitively. 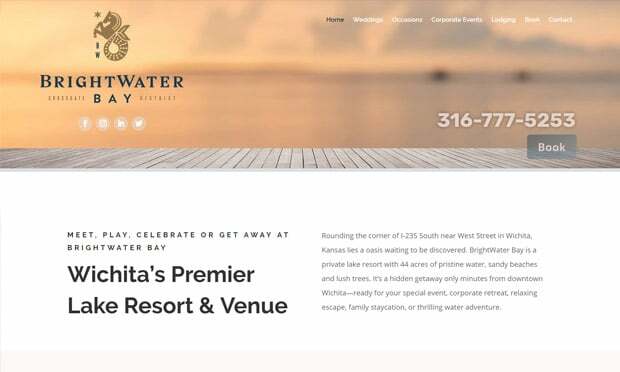 By getting back to the basics, we delivered BrightWater Bay a hardworking website that naturally pushes potential customers through the sales funnel. 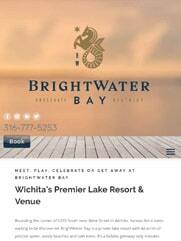 BrightWater Bay is a private lake resort located a few minutes from downtown Wichita, Kan. 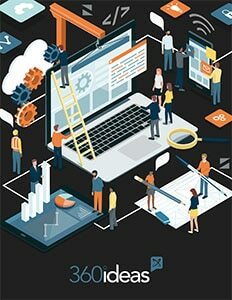 The client’s goal was to book more weddings and corporate events, but their old website didn’t reflect that. The focus was on watersports and the organization of their reservation options and how to book them was cumbersome. First, our team reworked the site’s navigation based on research and industry best practices. Then, we overhauled the content, focusing on SEO and strong calls-to-action on each page. One of the key new website features is a custom scheduling tool that allows visitors to make their own reservations. Previously, making reservations used to be a manual process and how to book varied between offerings. Now, using their site is as breezy as sitting out by the bay.